WHAT IS THE STANDARD of WELL TEMPERING (or EQUAL TEMPERAMENT)? 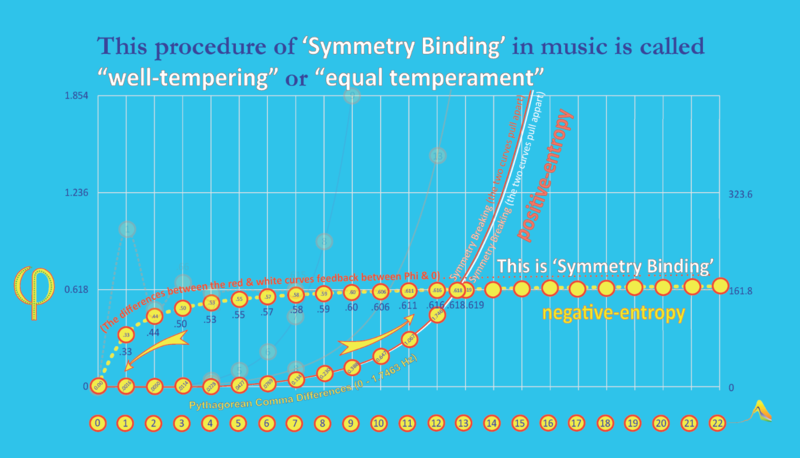 'Well Tempering' is a 'tuning standard' in music, where the octaves (or doublings) that govern the overtone series (halve the length double the frequency) also govern the subsidiary intervals within the octaves so all of the 12 semi-tone steps are exactly equal to each other. WHAT IS THE ESSENCE OF THIS STANDARD AS A PROCEDURE (PROCESS)? 'Normalization'. 'Well Tempering' creates a universal standard where, as the parts are derivations of the whole, the sum of the parts in any array, always commutes with the whole. WHY WAS WELL TEMPERING ADOPTED IN MUSIC? 'Normalization'. Each of these semi-tones is pre-set to enable music to be written (and played) with equal 'consonance', in any of the 12 keys arising on those steps. WHAT PROBLEM WAS THIS PROCEDURE HELPING TO OVERCOME? whereas with 'Well Tempering' it doesn't break down at all. WHY HAS WELL TEMPERING BEEN ADOPTED FOR UNFCCC-COMPLIANCE? sum to an emissions total that commutes with the carbon total consistent with UNFCCC-compliance. WHAT HAPPENS WITHOUT THIS WELL TEMPERING PROCEDURE FOR UNFCCC-COMPLIANCE? Carbon claims on the global commons, total quite randomly as the result of whatever happens inter-nationally. Consequently, logic-free prospects for UNFCCC-compliance break down deterministically as well. WHEN WAS WELL TEMPERING ADOPTED IN MUSIC? 'Well Tempering' goes back 1,000s of years. It was finally adopted in Western Music around the beginning of the 18th Century. WHEN WAS WELL TEMPERING ADOPTED FOR UNFCCC-COMPLIANCE? creating a global carbon-sharing standard since that time. UNFCCC-compliance knowing that [a] there is little time left to achieve it and [b] that in both 'music' & UNFCCC-Compliance, a well-tempered methodology is required for 'performance where the parts & the whole commute'. IS THERE AN UR-TEXT OF WELL TEMPERING MUSIC? Yes - J.C. Bach's 'Well Tempered Clavichord' ('48 Preludes & Fugues') in 1721. With now unrivalled status, this set a universal standard for all music making since that time. Yes - Return to All Country CREDIT DEBIT introduction and how the 'Well Tempered Climate Accord' needs again to become the guiding standard in the time we have left for compliance. WHAT IS THE MOST FUNDAMENTAL SOURCE FOR ALL THIS? 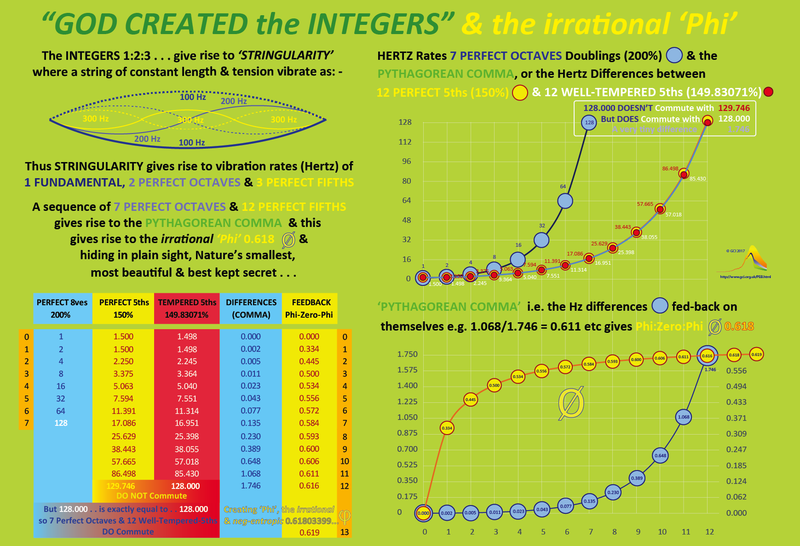 as 'symmetry-binding' it is always 'Phi-related' & remains true regardless of all & any other changes . . .
WHAT IS THE REAL SIGNIFICANCE OF ALL THIS? IT IS DEEPLY 'NUANCED'. [A] The derivation of 'Phi' is a function of the Stringularity axiom and the deviation that leads to the 'Golden Rate' (Hz). Phi is the basis of the 'god particle' (Higgs) and the 'god molecule' (Watson). Without this, the Universe & 'we' could not exist. fundamental to the 'quantum-fact' or wave-length:particle identity of the photon. [A] gives rise to 'rational-uncertainty' with the complimentary 'irrational-certainty' of [B].